Though I love the concept of the Roth, funding such an account has not been simple. Income must fall under IRS thresholds plus you must have the cash needed to make a contribution. In addition, its advantages must be weighed against the benefits of traditional IRAs, which reduce taxable income in the year you make the contribution as long as you meet IRS guidelines. The Roth was introduced in 1997, the year my second son was born; during that time, I had a busy schedule that did not include planning portfolio and tax strategies for my retirement. Recently, my husband's employer started offering the Roth designation in its 401(k) plan. 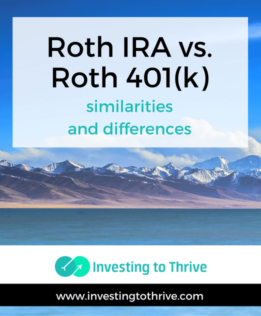 So, rather than mess with the Roth IRA, we decided to max out contributions to the Roth 401(k) (and fund any shortfalls in take-home income by selling shares of a concentrated holding). This move allows us to both diversify and boost our Roth account balances. Generally, I can pick the investments I want to include in a Roth IRA but I need to choose from a menu of investment choices for the 401(k) plan. A Roth 401(k) can be rolled over into a Roth IRA. Still, while saving for retirement, it's important to know the differences between the two types of accounts. Did you know that the Roth IRA is different than the Roth 401k? Have you funded a Roth account?